Leading marine scientists from around the world called on government leaders and policymakers to take immediate action to reduce carbon dioxide emissions in order to help slow the rate of ocean acidification. The rate at which the world’s oceans are becoming more acidic is increasing at an alarming rate, which threatens marine ecosystems, fisheries and the people that depend on them for sustenance and livelihoods, according to a group of 150 marine scientists from 26 countries attending a UNESCO forum in Paris February 2. The only way to avoid the negative ecological and socio-economic impacts is by limiting increases in atmospheric CO2 levels, they cautioned. Their views and call on governments to take action has been laid out in the “Monaco Declaration on Ocean Acidification,” developed by participants during a UN Educational, Scientific and Cultural Organization symposium in Monaco last October. The world’s oceans absorb about one-third of CO2 emitted into the atmosphere from burning fossil fuels, according to the Ocean Acidification Network . As CO2 is absorbed by seawater it becomes more acidic—it’s pH, the concentration of hydrogen atoms in it, decreases. Ocean pH has dropped by approximately 0.1 pH unit since the time of the industrial revolution. While this may not seem significant, scientists caution that to the best of their knowledge ocean pH has never changed as rapidly. “Such large changes in ocean pH have probably not been experienced on the planet for the past 21 million years,” they state. Even such small changes in ocean pH can have profound impacts on marine ecology and populations of marine organisms, particularly when it comes to calcareous plankton that form the base of the marine food chain, as well as commercial shellfish populations, such as clams and oysters, the group notes. 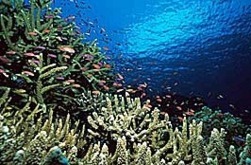 Research also indicates that increasing acidity and the removal of carbonate ions from ocean waters as a result of greater amounts of CO2 absorption adds to the threats facing the world’s shallow and deepwater coral reefs, critical areas of biodiversity and sources of food and livelihoods in areas where they exist. Shellfish and marine populations in high-latitudes are likely to be affected first, though even tropical zones will experience severe increases in acidity and lower calcium carbonate saturation levels before the middle of this century if CO2 emissions continue to increase at present rates, according to the group. In order to avoid what may prove to be disastrous changes to the marine environment, they advise governments, industry and individuals to take actions aimed at stabilizing atmospheric CO2 levels at 450 parts per million, lower than the 550 ppm advocated by many scientists as a level consistent with avoiding the worst impacts of climate change. Stabilizing atmospheric CO2 at 450 ppm—it’s presently around 380 ppm and rising—would lead to a pH decrease of about 0.17, within the 0.2 pH unit change they believe can serve as a boundary. At this level, some 7% of the Southern Ocean by the end of the century will still become undersaturated with aragonite, a variety of the calcium carbonate used by plankton and shellfish to build their shells. At 550 ppm, fully half the Southern Ocean would be, they estimate.